1.2. How Does Security Work? There are a few features you should be aware of when configuring authentication for your realm. 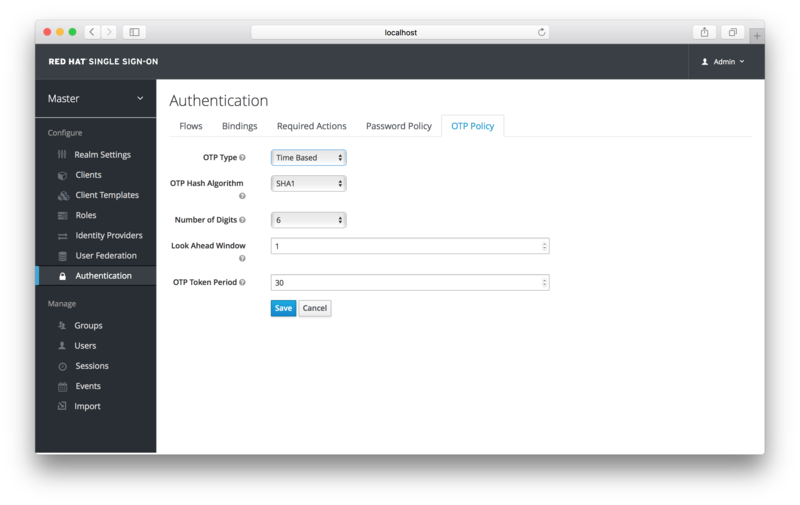 Many organizations have strict password and OTP policies that you can enforce via settings in the Admin Console. You may or may not want to require different credential types for authentication. You may want to give users the option to login via Kerberos or disable or enable various built in credential types. This chapter covers all of these topics. Each new realm created has no password policies associated with it. This means users can have as short, as long, as complex, as insecure a password as they want. This is great for development or if you are just learning and playing around with Red Hat Single Sign-On, but pretty much unacceptable in production environment. Red Hat Single Sign-On has a rich set of password policies you can enable through the Admin Console. Click on the Authentication left menu item and go to the Password Policy tab. Choose the policy you want to add in the right side drop down list box. This will add the policy in the table on the screen. Choose the parameters for the policy. Hit the Save button to store your changes. Unfortunately, users are not required to update their password if the password policy changes and there is no nice way of triggering an Update Password required action other than setting it manually for every user. This is scheduled as a future enhancement. Passwords are not stored as clear text. Instead they are hashed using standard hashing algorithms before they are stored or validated. The only currently supported algorithm is PBKDF2. This value specifies the number of times a password will be hashed before it is stored or verified. The default value is 20,000. This hashing is done in the rare case that a hacker gets access to your password database. Once they have the database they can reverse engineer user passwords. The industry recommended value for this parameter changes every year as CPU power improves. The current recommended value is 20,000. Yes, 20,000 iterations! This is a very intensive CPU operation and with this high of a setting your servers are going to be spending most of their CPU power on hashing. You’ll have to weigh what is more important to you. Performance or protecting your passwords stores. There may be more cost effective ways of protecting your password stores. How many digits are required to be in the password string? How many lower case letters are required to be in the password string? How many upper case letters are required to be in the password string? How many special characters like '? !#%$' are required to be in the password string? When set, password is not allowed to be the same as the username. Define a Perl regular expression pattern that passwords must match. How many days is a password valid for? After the number of days has expired, the user will be required to change their password. This policy saves a history of previous passwords. The number of old passwords stored is configurable. When a user changes their password they will not be able to re-use any password stored in history. Red Hat Single Sign-On has a number of policies you can set up for your FreeOTP or Google Authenticator One-Time Password generator. Click on the Authentication left menu item and go to the OTP Policy tab. Any policies you set here will be used to validate one-time passwords. When configuring OTP, FreeOTP and Google Authenticator can scan a QR code that is generated on the OTP set up page that Red Hat Single Sign-On has. The bar code is also generated from information configured on the OTP Policy tab. There are two different algorithms to choose from for your OTP generators. Time Based (TOTP) and Counter Based (HOTP). For TOTP, your token generator will hash the current time and a shared secret. The server validates the OTP by comparing the all hashes within a certain window of time to the submitted value. So, TOTPs are valid only for a short window of time (usually 30 seconds). For HOTP a shared counter is used instead of the current time. The server increments the counter with each successful OTP login. So, valid OTPs only change after a successful login. TOTP is considered a little more secure because the matchable OTP is only valid for a short window of time while the OTP for HOTP can be valid for an indeterminate amount of time. HOTP is much more user friendly as the user won’t have to hurry to enter in their OTP before the time interval is up. With the way Red Hat Single Sign-On has implemented TOTP this distinction becomes a little more blurry. HOTP requires a database update every time the server wants to increment the counter. This can be a performance drain on the authentication server when there is heavy load. So, to provide a more efficient alternative, TOTP does not remember passwords used. This bypasses the need to do any DB updates, but the downside is that TOTPs can be re-used in the valid time interval. For future versions of Red Hat Single Sign-On it is planned that you will be able to configure whether TOTP checks older OTPs in the time interval. Default is SHA1, more secure options are SHA256 and SHA512. How many characters is the OTP? Short means more user friendly as it is less the user has to type. More means more security. How many intervals ahead should the server try and match the hash? This exists so just in case the clock of the TOTP generator or authentication server get out of sync. The default value of 1 is usually good enough. For example, if the time interval for a new token is every 30 seconds, the default value of 1 means that it will only accept valid tokens in that 30 second window. Each increment of this config value will increase the valid window by 30 seconds. Time interval in seconds a new TOTP will be generated by the token generator. And, the time window the server is matching a hash. How many counters ahead should the server try and match the hash? The default value is 1. This exists to cover the case where the user’s counter gets ahead of the server’s. This can often happen as users often increment the counter manually too many times by accident. This value really should be increased to a value of 10 or so. What is the value of the initial counter? If you hover over the tooltip (the tiny question mark) to the right of the flow selection list, this will describe what the flow is and does. This authentication execution must execute successfully. If the user doesn’t have that type of authentication mechanism configured and there is a required action associated with that authentication type, then a required action will be attached to that account. For example, if you switch OTP Form to Required, users that don’t have an OTP generator configured will be asked to do so. If the user has the authentication type configured, it will be executed. Otherwise, it will be ignored. If disabled, the authentication type is not executed. This means that at least one alternative authentication type must execute successfully at that level of the flow. This is better described in an example. Let’s walk through the browser authentication flow. The first authentication type is Cookie. When a user successfully logs in for the first time, a session cookie is set. If this cookie has already been set, then this authentication type is successful. Since the cookie provider returned success and each execution at this level of the flow is alternative, no other execution is executed and this results in a successful login. Next the flow looks at the Kerberos execution. This authenticator is disabled by default and will be skipped. The first execution in the Forms subflow is the Username Password Form. This authentication type renders the username and password page. It is marked as required so the user must enter in a valid username and password. The next execution is the OTP Form. This is marked as optional. If the user has OTP set up, then this authentication type must run and be successful. If the user doesn’t have OTP set up, this authentication type is ignored. Red Hat Single Sign-On supports login with a Kerberos ticket through the SPNEGO protocol. SPNEGO (Simple and Protected GSSAPI Negotiation Mechanism) is used to authenticate transparently through the web browser after the user has been authenticated when logging-in his session. For non-web cases or when ticket is not available during login, Red Hat Single Sign-On also supports login with Kerberos username/password. User logs into his desktop (Such as a Windows machine in Active Directory domain or Linux machine with Kerberos integration enabled). User then uses his browser (IE/Firefox/Chrome) to access a web application secured by Red Hat Single Sign-On. Application redirects to Red Hat Single Sign-On login. In case that the browser has Kerberos ticket from desktop login, it transfers the desktop sign on information to the Red Hat Single Sign-On in header Authorization: Negotiate 'spnego-token' . Otherwise it just displays the login screen. Red Hat Single Sign-On validates token from the browser and authenticates the user. It provisions user data from LDAP (in case of LDAPFederationProvider with Kerberos authentication support) or let user to update his profile and prefill data (in case of KerberosFederationProvider). 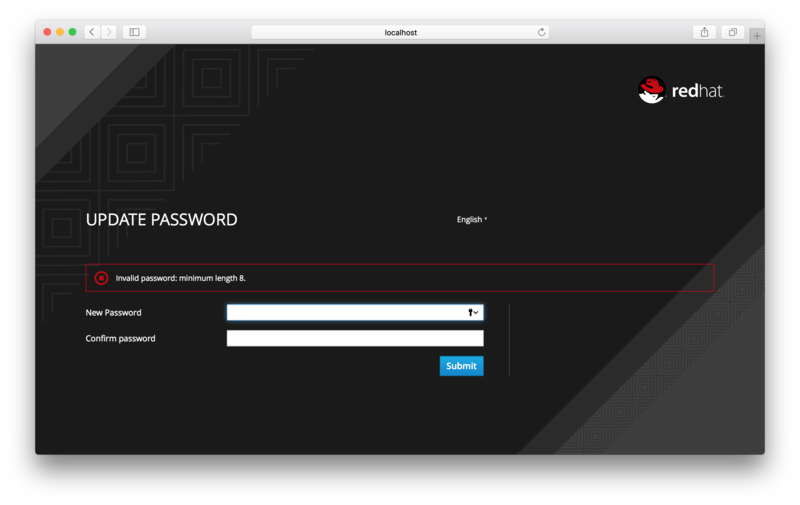 Red Hat Single Sign-On returns back to the application. Communication between Red Hat Single Sign-On and application happens through OpenID Connect or SAML messages. The fact that Red Hat Single Sign-On was authenticated through Kerberos is hidden from the application. So Red Hat Single Sign-On acts as broker to Kerberos/SPNEGO login. This is platform dependent. Exact steps depend on your OS and the Kerberos vendor you’re going to use. Consult Windows Active Directory, MIT Kerberos and your OS documentation for how exactly to setup and configure Kerberos server. Add some user principals to your Kerberos database. You can also integrate your Kerberos with LDAP, which means that user accounts will be provisioned from LDAP server. Add service principal for "HTTP" service. For example if your Red Hat Single Sign-On server will be running on www.mydomain.org you may need to add principal HTTP/www.mydomain.org@MYDOMAIN.ORG assuming that MYDOMAIN.ORG will be your Kerberos realm. The Keytab file /tmp/http.keytab will need to be accessible on the host where Red Hat Single Sign-On server will be running. Next you need to export the keytab file with the HTTP principal and make sure the file is accessible to the process under which Red Hat Single Sign-On server is running. For production, it’s ideal if it’s readable just by this process and not by someone else. For the MIT Kerberos example above, we already exported keytab to /tmp/http.keytab . If your KDC and Red Hat Single Sign-On are running on same host, you have that file already available. Red Hat Single Sign-On does not have the SPNEGO protocol support turned on by default. So, you have to go to the browser flow and enable Kerberos. Switch the Kerberos requirement from disabled to either alternative or required. Alternative basically means that Kerberos is optional. If the user’s browser hasn’t been configured to work with SPNEGO/Kerberos, then Red Hat Single Sign-On will fall back to the regular login screens. If you set the requirement to required then all users must have Kerberos enabled for their browser. Now that the SPNEGO protocol is turned on at the authentication server, you’ll need to configure how Red Hat Single Sign-On interprets the Kerberos ticket. This is done through User Storage Federation. We have 2 different federation providers with Kerberos authentication support. 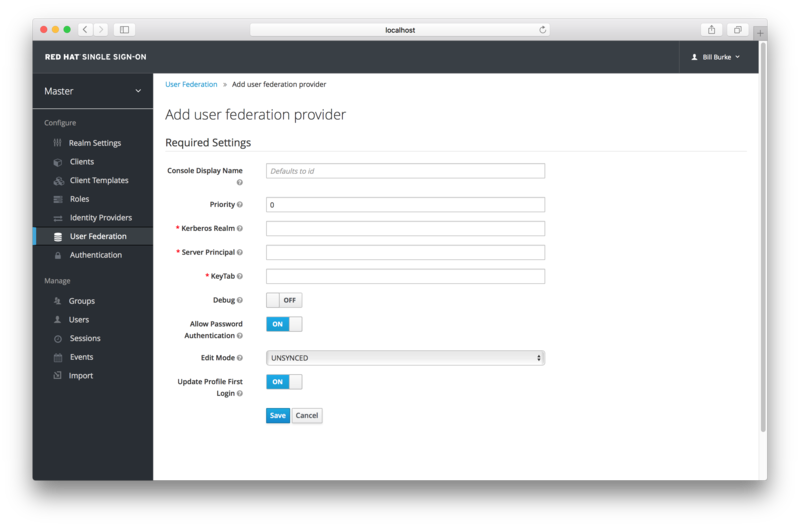 If you want to authenticate with Kerberos backed by an LDAP server, you have to first configure the LDAP Federation Provider. If you look at the configuration page for your LDAP provider you’ll see a Kerberos Integration section. 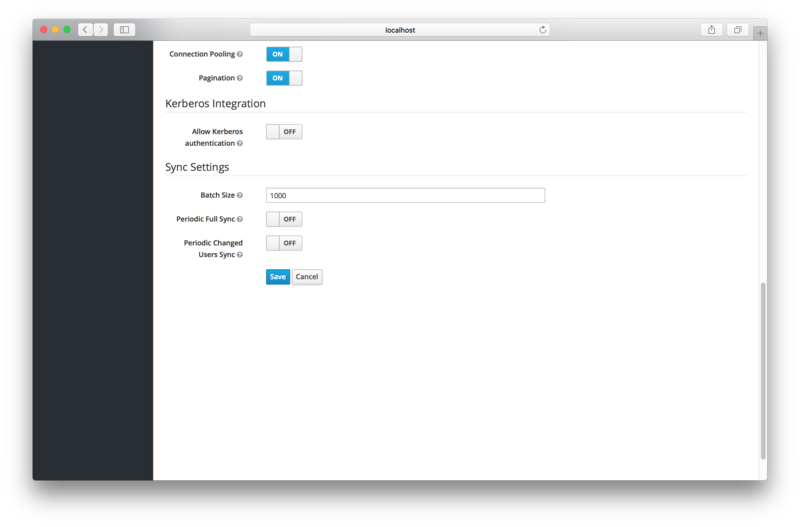 Turning on the switch Allow Kerberos authentication will make Red Hat Single Sign-On use the Kerberos principal to lookup information about the user so that it can be imported into the Red Hat Single Sign-On environment. If your Kerberos solution is not backed by an LDAP server, you have to use the Kerberos User Storage Federation Provider. Go to the User Federation left menu item and select Kerberos from the right Add provider select box. This provider parses the Kerberos ticket for simple principal information and does a small import into the local Red Hat Single Sign-On database. User profile information like first name, last name, and email are not provisioned. Clients need to install kerberos client and setup krb5.conf as described above. Additionally they need to enable SPNEGO login support in their browser. See configuring Firefox for Kerberos if you are using that browser. URI .mydomain.org must be allowed in the network.negotiate-auth.trusted-uris config option. In a Windows domain, clients usually don’t need to configure anything special as IE is already able to participate in SPNEGO authentication for the Windows domain. Kerberos 5 supports the concept of credential delegation. In this scenario, your applications may want access to the Kerberos ticket so that they can re-use it to interact with other services secured by Kerberos. Since the SPNEGO protocol is processed in the Red Hat Single Sign-On server, you have to propagate the GSS credential to your application within the OpenID Connect token claim or a SAML assertion attribute that is transmitted to your application from the Red Hat Single Sign-On server. To have this claim inserted into the token or assertion, each application will need to enable the built-in protocol mapper called gss delegation credential. This is enabled in the Mappers tab of the application’s client page. See Protocol Mappers chapter for more details. // Obtain accessToken in your application. String serializedGssCredential = (String) accessToken.getOtherClaims(). Note that you also need to configure forwardable kerberos tickets in krb5.conf file and add support for delegated credentials to your browser. Credential delegation has some security implications so only use it if you really need it. It’s highly recommended to use it together with HTTPS. See for example this article for more details.